作者: The AsiaN Editor on 13 September , 2018. 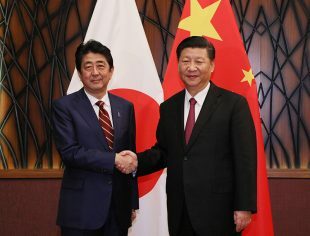 The leaders of China and Japan have pledged to speed up cooperation in the latest sign that the two Asian rivals are mending ties strained by territorial and historical disputes. On the sidelines of the Eastern Economic Forum in the eastern Russian city of Vladivostok, Chinese President Xi Jinping told Japanese Prime Minister Shinzo Abe that the two countries should “firmly defend multilateralism, the free trade system and the rules of the World Trade Organisation to push forward an open global economy”, state-run Xinhua News Agency reported. Relations between China and Japan “are getting back on track” with great opportunities ahead for further improvement, Xi told Abe. But the Chinese president urged Japan to properly handle “sensitive issues over history and Taiwan to forge a good atmosphere and to continue expanding common interest”. Xi and Abe were in Vladivostok for a three-day summit hosted by Russian President Vladimir Putin to promote investment in Russia’s far east. Before his meeting with Xi, Abe said the two neighbours had engaged in broad cooperation “in all areas, with active communication and dialogue”, Japanese news agency Kyodo reported. “The horizon of cooperation is extending,” Abe was quoted as saying. Beijing and Tokyo have taken a number of steps to improve ties and relations have stabilised in recent months as the US has ramped up trade pressure on both China and Japan. In May, Chinese Premier Li Keqiang visited Tokyo, the first such visit by a Chinese premier over eight years, and high-level Japanese officials, including Toshihiro Nikai, secretary general of Japan’s ruling Liberal Democratic Party, met Chinese Vice-President Wang Qishan in Beijing late last month. There has been speculation that Abe will visit China around October 23, the 40th anniversary of the signing of the Treaty of Peace and Friendship between Japan and China, which laid the foundations for diplomatic ties between the two countries. Abe also said the two countries had “reaffirmed the commitment to deepen cooperation”, and agreed to work together in preparation for his October visit to Beijing, the first visit to China’s capital by a Japanese prime minister since 2011. Kyodo quoted Japanese deputy chief cabinet secretary Kotaro Nogami as saying the Chinese president said he would give consideration to Abe’s invitation to Japan. Xi also told Abe that the “Belt and Road Initiative”, China’s trillion-dollar infrastructure and investment programme across Eurasia and beyond, could open “a new platform and a test field” to bilateral cooperation. Japan was welcome to continue to take part in China’s economic reform, he added. Huang Dahui, a professor of Japanese studies at Renmin University, said the two Asian powers were seeking rapprochement in the face of the hardline trade policy of US President Donald Trump. “China and Japan are two beneficiaries of global free trade, and Trump’s [trade] policy has actually pushed China and Japan closer,” Huang said. But with no sign of a quick solution to their decades-old territorial and historic disputes, the reconciliation between the two neighbours would remain fragile and mostly focused on the economic front, Huang said. “There are great uncertainties ahead and we can’t rule out any negative impact over China-Japan relations if the US changes its position on East Asia,” he said. In the meantime, officials from Beijing and Tokyo are discussing cooperation on the Bangkok Mass Transit System project in Thailand, according to Japan’s Asahi newspaper. If confirmed, this would be the first belt and road project between China and Japan in a third country, and Tokyo’s Free and Open Indo-Pacific Strategy, a similar grand strategy in which Japan is seeking to improve links between Asia and Africa.